IELTS Writing task 1. Grammar and vocabulary for describing a line graph. Vocabulary and grammar for line graphs and describing trends. In Writing task 1 academic you need to write a report about a bar chart, a line graph, maps, a pie chart or a process diagram. In this case we are going to look at describing a line graph in IELTS writing task 1 and the kind of grammar and vocabulary that is needed for this task. 1. Sales of ice cream flattened out toward the end of the period. 2. Sales of ice cream showed some fluctuation between 2000 and 2008. 3. Car export figures hit the lowest point in 2014. 4. The figure for CO2 emissions was the third highest among the four countries. 5. Coal exports showed a downward trend throughout the 10 year period. 6. The number of cars sold levelled off in the last part of the 20 year period. 1. There was a substantial increase in the value of stocks on March 15th. 2. House prices rose dramatically in July. 3. The number of tourists visiting New York fell sharply in October. 4. The number of students studying Economics rose gradually from 2001 to 2010. 5. There was a sharp increase in employee turnover after the strike. 6. Interest in environmental issues has risen steadily over the last 10 years. 7. The proportion of biofuels used in Germany in 2009 rose marginally from 30% to 32%. Dropped from 200 units to 120 units in a period of 6 months. Rose sharply over a period of 5 years. Note: This task is not an official Cambridge task, this is for practice purposes only. The line graph below shows exports of rubber ducks from 2013 to 2017. Exports of rubber ducks in the USA ___ 2013 started ___ 10,000 units and ____ slightly to around 15,000 units, they ________ off and fell ______ by 2016 to around 13,000 units. However_____ 2016 ____ 2017 exports fell sharply ending ___ only 2,000 units. In contrast, exports of rubber ducks from the EU started well at 30, 000 units and rose_________ but then ________ gradually in 2015 to 21,000 units. Soon after, the trend grew _________ to over 33,000 units in 2016 and _______ at 40,000 units in 2017. Similarly, in the UK exports _____ steadily from 2014 ending at 40,000 units ___ 2017. Exports of rubber ducks in the USA in 2013 started at 10,000 units and rose slightly to around 15,000 units, they levelled off and fell slightly by 2016 to around 13,000 units. However from 2016 to 2017 exports fell sharply ending at only 2,000 units. 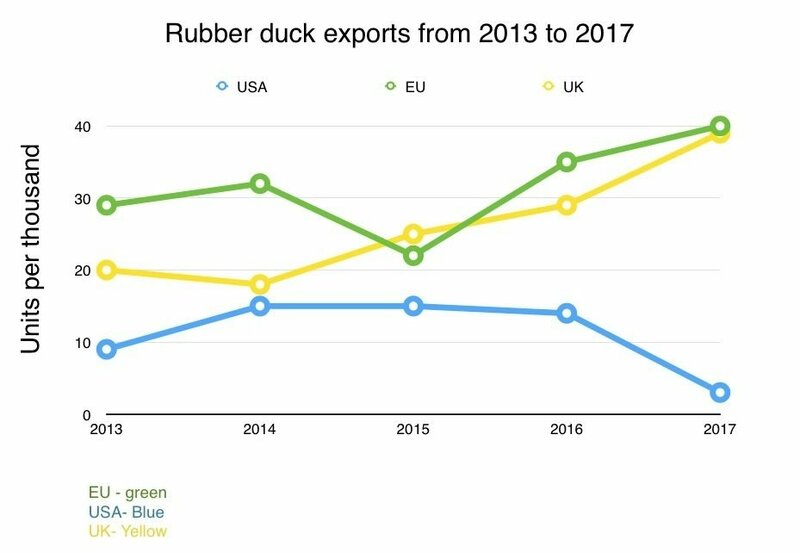 In contrast, exports of rubber ducks from the EU started well at 30, 000 units and rose gradually but then dropped gradually in 2015 to 21,000 units. Soon after, the trend grew steadily to over 33,000 units in 2016 and peaked at 40,000 units in 2017. Similarly, in the UK, exports rose steadily from 2014 ending at 40,000 units in 2017. Key point: When writing the task 1 report you do not have to cover everything in the chart or graph as I have done above, you need to summarise the data and write about the key features only.